When working in record mode, it is possible to compare all the value within one record and see if those are unique. To do that we will introduce the function forEach() that let turn the record into an array and count unique value. Split multi-valued cells function helps to transpose data stored in one cells into multiple rows, while keeping the relationship with the other columns in the data set. In this article we will see some of the limitation of the function when splitting and joining back a data set and how you can work around it. Learn the basics of data science with the new OpenRefine Foundation course available on the tranzform course platform. 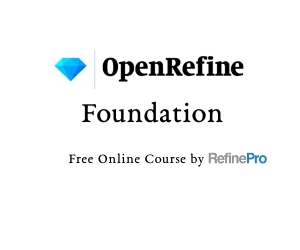 The OpenRefine Foundation course is a progressive program that provides structure and direction for students new to data cleaning and preparation. 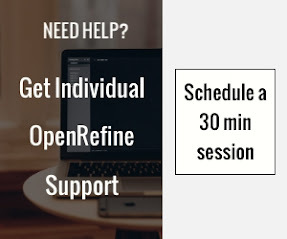 Each lesson comes with a comprehensive overview of its goals and content, five video tutorials, and a lab to put your learning into practice. The course ends with a quiz to test your knowledge. Exploring Toronto 311 calls Part1: Why people are calling? Toronto 311Service Request - Customer Initiated contains information on on customer initiated service requests received by the city of Toronto for Solid Waste Management, Transportation Services, Toronto Water, Municipal Licensing & Standards, and Urban Forestry related request. In this first article we will explore the relationship between the type of request and its creation date. In partnership with the OKFN School of Data , we recorded last November an hour Skillshare on Refine GREL Language. Always wonder how to get started with the Generic Refine Expression Language (GREL)? I recently helped someone on stackoverflow to parse and extract information from an HTML page. Refine with GREL offer multiple ways to select specific element and contant. This article will review the main functions and specific use cases to illustrate when to use them.